His Excellency Dr. Péter Györkös became the Ambassador of Hungary to Germany in 2015. 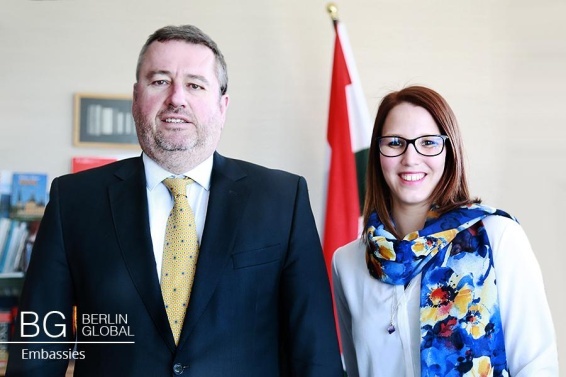 On the 9th of May the team of Berlin Global visited the embassy to gain an insight into the everyday life of the embassy. Hungary gained its independence after the collapse of the Soviet Union and since than it has became a member of the United Nations, the NATO and the EU. During the interview we discussed the Ambassador’s career, Hungary’s economic position and the current crisis of the EU, including the migration crisis. 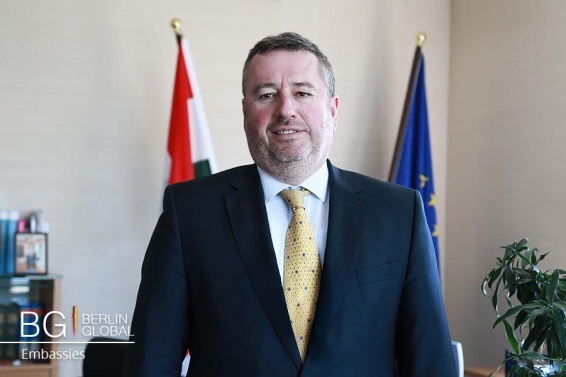 You have had a very successful career, you have been the Ambassador of Hungary to the Republic of Croatia and the Head of the Permanent Representation of Hungary in Brussels among others, and now, since 2015, the Ambassador of Hungary to Germany. How do you compare these positions and what was the most challenging moment in your career? Comparing these kind of positions is difficult, because they have different nature, at the same time the global framework is always clear, that the Ambassador has to contribute to the development of the bilateral relations or within the framework of international institutions. There were interesting moments, for example the Presidency of the Council of the EU in the first semester of 2011, which was a nice and unique exercise to manage it as a Permanent Representative. Also we can mention the Constitutional process of Hungary, the Excessive Deficit Procedure or some infringement cases which had to be kept under control. Here in Germany we have very traditional, horizontal, broad relations. On the other hand, due to the geographical location of my country sometimes there is an intensive need to explain why and what are we doing. But I guess it is a rather normal part of the job description of an ambassador. What is the main focus of your work here in Germany? In a normal mood, it is obviously deepening and strengthening the bilateral relations with the special emphasis of the economic ties. But at the same time, nowadays the migration crisis gives a special flavor of this relationship, which has to be taken into account. There is a rather long list of potential areas beyond economics and politics, like culture or context between twin cities, which nowadays have a more important relevance in order to demonstrate the colorful relationship between the two countries. As far as I know, early in your career you had already worked in Germany, in the Hungarian Embassy in Bonn. It has been 20 years, in your personal experience, what have been the most important changes in Germany? It is a very broad question. By that time we were in the so called Bonn Republic. The symbolism of moving the capital from Bonn to Berlin reflects the very importance of the unification of Germany, which was a successful exercise and has its impacts both on Germany and on Europe. So in that sense it is natural that the situation is a bit different from that of the early 90s. What we see now is that in a period when Europe is shaken by different kind of crisis, the role of Germany is special. For example by managing the financial crisis, when we are talking about the future of the competitiveness of Europe or relevant foreign policy issues like the Ukraine policy of the EU or the sanctions policy against Russia, and last but not least the migration crisis. It is always a starting point for a diplomat to try to understand what and why the Germans are doing what they are doing. How have relations between Germany and Hungary changed over these years and in what ways is the Hungarian Embassy in Berlin promoting Hungarian culture? Nothing has changed the fact that for Hungary, Germany is the most important partner and the scope and magnitude of this relationship has been substantially strengthened. If I only mention the volume of the economic relations, we have more than 6 thousand German companies acting in Hungary. Politically, except for this very one issue on migration the relationship is historically solid and friendly. As far as culture is concerned there has been always an interest in Germany for the Hungarian culture. Culture has its mission going back to historical times and to the modern era. Beyond the Embassy we have two cultural institutes, the Collegium Hungaricum in Berlin and the Hungarian Cultural Institute in Stuttgart which also contribute to this cultural cooperation and dialogue. There are sometimes happy developments, like the Oscar praised work of the Hungarian film director, Mr. Nemes, which has been also presented here in Germany. There is also a permanent presentation of Hungarian classical music, and we are now working on the so called Jugendwerk, a kind of framework for use cultural cooperation. Does the Hungarian-German Forum have a special interest? It is a traditional framework for dialogue beyond the formal political-social contexts. It was established in 1991, and it has become the basic treaty between Germany and Hungary as a framework for a brotherly dialogue between the two countries. So I would say it is in that sense an internal part of the bilateral relations. Today is the 9th of May, the Day of the European Union. Hungary has been a Member State since 2004. Considering that you participated in the accession negotiation process with the EU, how would you evaluate this more than 10 years within the EU and what are your personal expectations for the future? We have to say and I guess we can prove it that the so called Eastern Enlargement was a successful one. If we look back in history we can remember how many negative forecasts were launched by that time, that the EU will collapse if so many new member states arrive with a different historical background. We can see 12 years later that the Eastern European Member States have been integrated successfully, they are contributing to the economic and the political strength of the EU, they are good Europeans, they are implementing the European legislation at a very high level, they are economically and financially solid and they contribute to increasing the competitiveness of the European economy. In the shadow of the migration crisis there is, by the way totally incorrect atmosphere generated, saying that the Eastern Enlargement might have been a problem, it slowed down European integration and the coherence of European policy, which I guess is absolutely not the truth. What about the future? It is difficult to say because we are facing some parallel challenges and potential crisis, like the continuation of the financial crisis, the migration crisis and in a bit more than one month we will have the referendum in the United Kingdom on their future in the EU which will have a horizontal impact on the future of the EU, so in that sense it is difficult to give you a solid forecast. I try to be confident that Europe will be able to manage these difficult items, separately or combined. Hungary has been traditionally promoting the future enlargement of the EU. We think that it is the best security instrument in the EU, but there are different views about enlargement. Ultimately for us the real candidates are the Western Balkan countries. If you look at the map you can see that these countries are surrounded by states who are both members of NATO and of the EU. The other potential direction could be our Eastern Partnership region and there is the very special case of Turkey, which is intensively discussed nowadays. We will see how it will developed, but I guess that it has been so far always been possible to combine the strategic aspects with the technical nature of the fulfillment of the accession criteria. We consider that it should go forward, but at the same time we have to recognize, that it is not necessarily the majority view nowadays in the EU. Euroscepticism and the popularity of the far right is a current problem on almost all sides of Europe, including Hungary. What do you think, how does the rising of far right wing politics affect the reputation of Hungary abroad, especially in Germany? I agree that this problem is a horizontal European issue and of course I am in a rather combative mood if somebody wants to limit this phenomenon to individual countries. In my country, a very radical party is represented in the Parliament, but not in the Government, at the same time in other member states radical or extreme right parties are sometimes in coalition Governments. Where I can see a difference is that the argumentation here towards the “Eastern” European countries is much more critical. In the shadow of the financial crisis and in particular the migration crisis, it certainly places a role in the enforcement of a position of the extreme right parties. I can see, that the classical democratic parties are in an uncertain position how to deal with that kind of phenomenon, what kind of relationship they have to establish towards these parties. It is a rather new phenomenon with this magnitude and the best what we can do is to support democratic forces and develop a policy which is based on content. Germany is Hungary's most important trading partner both in export and in import. Did the Eastern Opening in the Foreign Economic Policy of Hungary change this special relationship and why? Not at all. I would say that the ratio of Germany in the Hungarian foreign economic relations is as strong as before the launching of the Eastern Opening or the Southern Opening. The philosophy behind these measures is that without slowing down the increase of our economic ties with Germany or with the EU, we have to try to establish more flourishing economic relations with other parts of the world. If you look at the economic statistics you can see that Hungary is one of the most integrated economies into the Single Market of the EU, the intercommunity trade is more than 80%. It is not against something, it is kind of an additional, complementary dimension. There is an obvious disagreement between Germany and Hungary on the topic of the refugee or migrant crisis. How did the Hungarian Government’s policy affect your responsibilities as an Ambassador in Germany? I have to say, that even if I admit, that the general prospection sends the message as if we had a substantial conflict between Berlin and Budapest, I have to tell you that as far as concrete issues are concerned, we have the same position on the overwhelming majority of the issues. For example the point about the necessity to be able to control our external borders, that we have to do everything to avoid reintroduction of internal border controls, that we have to try to help people as close as possible to their home regions or that to deliver all the adequate financial and humanitarian systems. So in all these issues our positions are basically identical. There is one point, I admit where we do not share the same approach which is the distribution of migrants, but we have full respect of the German opinion. We stick to the agreement at the level of the heads of state who three times so far endorsed the principle of a voluntary distribution of migrants. We would like to stick to this point which is a subject of discussion both between Hungary and Germany and also at the level of the 28 members. In the Economist’s list about the environment for working woman, Hungary ranked fifth right after the Nordic countries, nevertheless the female representation in the Parliament is low. What do you think about women's position in Hungary and what kind of example Hungary is setting for other countries? It is true that it is part of the current economic and social policy of the Government to try to help woman to get children, as part of the so called Brother Family Policy. It is supported by a lot of different benefits, tax allowances and with flexibility of the labor market, that women can decide whether to return or stay on maternity leave. It is a pillar of the Hungarian Government’s policy to try to combine the private life with the professional one, and in that spirit help women to choose what for them the best solution can be. Your whole career is dedicated to international relations, what advice would you give to young people who are interested in pursuing a career in international relations or diplomacy? It is an interesting job, while of course it is difficult to define what exactly diplomacy means. To deal with international relations with other countries, with other people, with other cultures. I can encourage everybody, because I do not think, that the European integration would replace in one way or another the bilateral relations of the individual states, it is a comparative element but not an exclusive one so in the future it will be always relevant and interesting job.